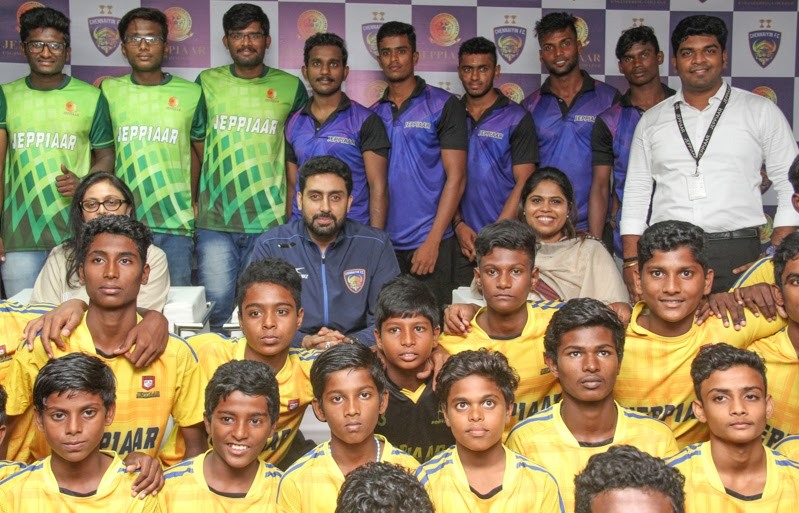 Actor Abhishek Bachchan launched Chennaiyin FC Soccer School at Jeppiaar Engineering College. Jeppiaar Engineering College is one of the renowned educational institute in the Country, which provides finest academic and extra-curricular settings to students who crave to achieve greater success. College has always been a great supporter of Sports as much as Academics, and have established a strong foundation in sports with their impeccable achievements in athletics, handball, volleyball, and so on. Jeppiaar Engineering College will be the Official Education Partner to Chennaiyin FC, a professional football club of the ISL (Indian Super League), providing Academic & Educational opportunities to students. 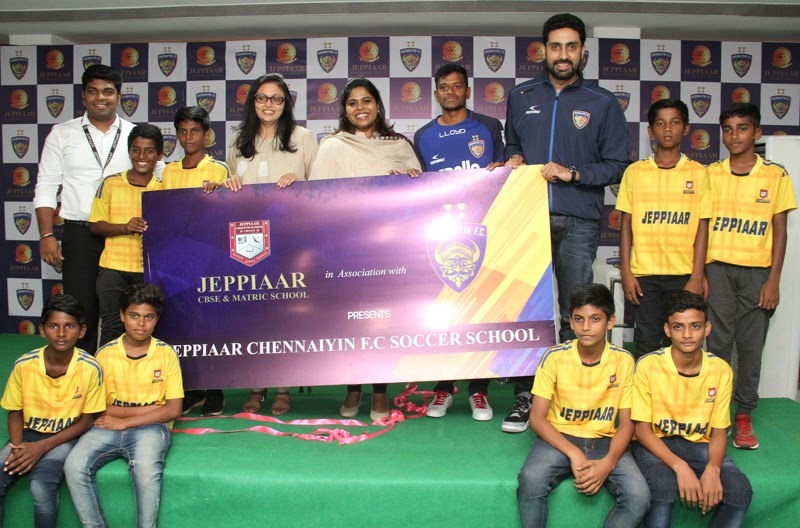 Additionally, Jeppiaar Matric and CBSE Schools in association with Chennaiyin FC, is launching a new school, Jeppiaar Chennaiyin FC Soccer School, which will provide a training platform and an opportunity to learn gameplay strategies in Football for interested students. Jeppiaar Engineering College and Jeppiaar Schools in association with Jeppiaar Sports Academy have so far aided more than 450 economically underprivileged students with a scholarship that covers the entirety of accommodation, education, training and training materials, and admission in Jeppiaar School /College. Jeppiaar Sports Academy has provided grass-root level training to talented individuals in football, and the students have proven their talents time and time again with their various recognitions and achievements. Jeppiaar Engineering College Football Team has been renowned as a best football team in Tamilnadu, and has retained the No.1 title for the past three years. Some of the well recognized players are currently playing for different clubs and even have received offers in Indian Railways, Indian Bank, and other top professional Football Clubs. One such student was Mr.Pandiyan Srinivasan, a former Student of Jeppiaar Engineering College Football Team, who has been selected to play for the Chennaiyin FC professional team. Jeppiaar College is also known for achievements in other Sports, such as Kabaddi, Volley Ball, Handball, and our teams have achieved a wide recognition in Tamilnadu, with students garnering trophies and offers from different clubs and teams. Support and recognition of Sports is the core of Jeppiaar Institutes and as such same recognition and support is provided in Jeppiaar School, and due to which Sports in CBSE & Matric School, has been recognized as part of the curriculum and is not much surprising, given the very support has garnered a national recognition in the form of their Kabaddi Team, who have proved themselves as the best team in Tamilnadu, and also is a Runner in Pro-Kabaddi Juniors National Championship last season. Actor, Producer & Entrepreneur and Co-owner of 'Chennaiyin FC', and Mrs Vita Dani, Co-owner of ‘Chennaiyin FC' and Chairperson of 11EVEN Sports.